Our NetStaX™ suite of protocol stack source code solutions enable network connectivity, simplify your application software, improve reliability, and shorten your product’s time to market. We offer 10 different NetStaX Solutions that introduce EtherNet/IP, DeviceNet, ControlNet, CANopen, PROFINET and J1939 functionality into your products and systems. NetStaX EtherNet/IP Adapter Development Kit (EADK) with Adapter Class Stack enables you to quickly introduce EtherNet/IP Adapter (server) Class functionality to your products and systems. Pyramid Solutions’ NetStaX EtherNet/IP Scanner Development Kit (ESDK) with Scanner Class Stack allows you to quickly introduce EtherNet/IP Scanner (client) Class and/or Adapter (server) Class functionality to your products and systems. Add scalable DeviceNet Slave (server) functionality to your products with our NetStaX DSDK. This field-proven source code rapidly integrates into your product and includes documentation and example application code for a Hitachi H8S with an SJA1000 CAN Controller, AMD 80188EM with an SJA1000 CAN controller and Infineon (Siemens) C167CR with an internal CAN controller. The NetStaX DMDK allows users to rapidly integrate field-proven master (client) and I/O scanner source code into DeviceNet products. The source code operates in a real-time, multitasking operating system that supports messaging queues, event flag recognition, interrupt handling and timer functions. Add Adapter and Messaging Class functionality to products using field-proven software source code available from the inventor of ControlNet, Rockwell Automation. The NetStaX CADK comes with ControlNet Adapter Class example code (CNA30S) which gives product developers a complete set of functions to enable ControlNet connectivity. Add ControlNet Scanner, Adapter and Message Class functionality to products with NetStaX CSDK. This field-proven source code is available from the inventor of ControlNet – Rockwell Automation. The CSDK includes ControlNet Scanner Class example code (CNA40S), which gives product developers a complete set of functions to enable ControlNet connectivity as defined in the ControlNet specification. Pyramid Solutions’ NetStaX CANopen Master Development Kit (COMDK) enables you to quickly introduce CANopen Master functionality into your products and systems. The COMDK CANopen Master Software Protocol Stack provides all required services for CANopen compliant communications, according to the communication profile CiA 301 V 4.2. 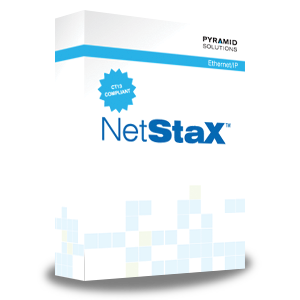 Pyramid Solutions’ NetStaX CANopen Slave Development Kit (COSDK) enables you to quickly introduce CANopen Slave functionality to your products and systems. The COSDK CANopen Software Protocol Stack provides all required services for CANopen compliant communications according to the communication profile CiA 301 V 4.2. The NetStaX PROFINET Device Development Kit (PDDK) enables you to quickly introduce PROFINET Device (Slave) functionality into your products and systems. The PDDK provides conformance Class A, together with real-time Class 1 and Class UDP functionality. The NetStaX J1939 Device Development Kit (JDDK) enables you to quickly introduce J1939 functionality into your products and systems. It’s software protocol stack provides J1939 messaging and diagnostics functionality.